No one is more aware of the Road to Richmond’s stop in Bristol this weekend than Kasey Kahne. But after two consecutive finishes off the lead lap in Bristol, he needs the half-miler to cooperate on Saturday night. With four straight Top 10 finishes from 2012-2014, this is probably his best bet to snag his first win of the season and lock in a fourth straight Chase appearance. 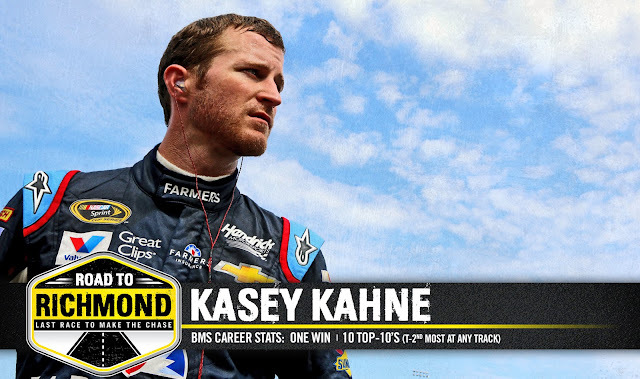 Fan girls (and maybe a few guys) are praying to see a flash of “Kase-Lightning” in Thunder Valley this weekend. Recent history hasn’t been kind to Kasey at RIR. His only win at the track came back in 2005, which was his very first Sprint Cup Series win. But since Kasey joined Team Hendrick, he has found himself finishing in the Top 10 only twice. On the bright side, one of those Top 10s was this past April at the TOYOTA OWNERS 400. A solid warm-up at Bristol might just be what this driver needs to recapture glory in Richmond. Darlington is a wild card for Kasey. Despite four poles there, his most at any track on the circuit, he’s without a win there in 12 races. If he can throw it back at Darlington all the way to his first CWTS win in 2004, he might stand a chance. Luck needs to be a “Lady in Black” if Kasey hopes to continue his season. A few other names to keep in mind as the season makes it's way to Bristol this weekend.